The United States and Russia will begin talks Thursday morning aimed at calming tensions between their opposing military operations in Syria, two senior defense officials told NBC News. The "very high-level" discussions will begin at 11 a.m. ET, one official said. Russia defended its latest round of airstrikes in Syria amid mounting questions over their targets, insisting that Moscow's planes had struck ISIS installations. U.S. officials have questioned whether Vladimir Putin's airstrikes — in the name of defeating ISIS — were genuinely targeting the group or were instead a cover to shore up Syrian President Bashar Assad by bombing anti-government rebel groups. It also has raised fears over how the Cold War rivals can safely share airspace as they run separate anti-ISIS campaigns and hiked tensions. Assad is the Kremlin's key ally in the Middle East and Russia maintains a naval facility in the country. While Russia's defense ministry said its warplanes were conducting "surgical strikes" on ISIS' military equipment, communication hubs and fuel depots, Secretary of Defense Ash Carter said the bombardments didn't appear to be targeting areas held by ISIS forces. 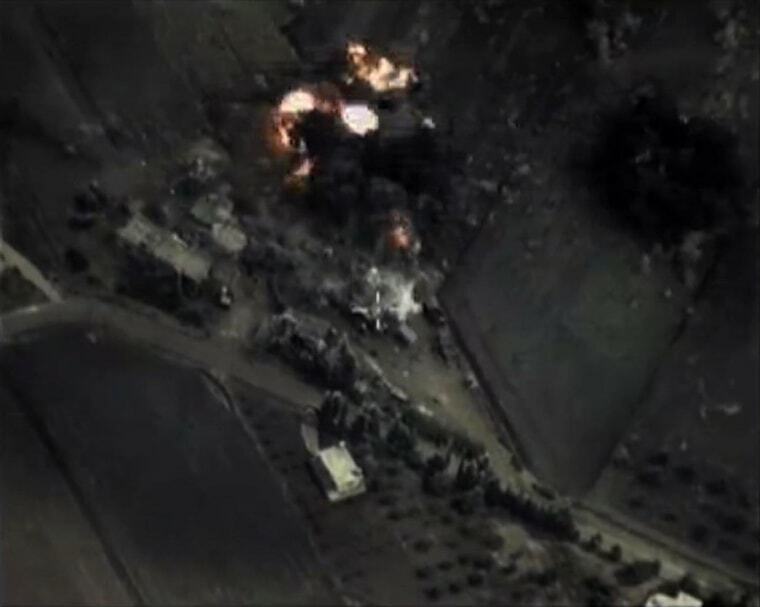 Russia's defense ministry late Wednesday said it had carried out 20 airstrikes, according to The Associated Press. By comparison, the U.S. conducted one airstrike over Syria the same day. Moscow's warplanes hit four more ISIS targets in Syria overnight, according to a statement Thursday from the Ministry of Defense. It said the strikes destroyed a terrorist command center and ammunition depot in the Idlib area, a militant-command center in the vicinity of Hama and a facility near Homs producing explosives-rigged cars. Meanwhile, Russia's ambassador to France said Thursday that targets a day earlier had hit installations for ISIS and the al Qaeda-linked Nusra Front, according to The Associated Press. It reported that Alexandre Orlov dismissed allegations civilians were killed in the strikes, telling France Info radio that "there has been a certain war of disinformation for some time" and insisting Russia was "acting transparently." The Russian jets have joined an already-crowded airspace over Syria: U.S. and allied planes have been flying sorties, as are Syrian regime jets. The Russians gave less than an hour's notice that the bombings were about to begin, according to a U.S. defense official. State Department spokesman John Kirby said Wednesday that a Russian official in Baghdad had requested American aircraft avoid Syrian airspace during Moscow's missions — but told reporters that the U.S. led coalition would continue to fly over Iraq and Syria "as planned." The head of the Syrian opposition, Khaled Khoja, said the initial airstrikes killed civilians and that it was "very obvious" Russia didn't go into Syria with ISIS in mind. "It is clear that the objective of the Russian occupation is to prolong the regime and to support the regime in the killing of innocent civilians," Khoja said Wednesday. U.S. Rep. Ed Royce, Chairman of the House Foreign Affairs Committee, said "the Russians don’t appear to be holding back in their efforts to shore up the murderous Assad regime." Secretary of State John Kerry said the U.S. would have "grave concerns should Russia strike" areas where ISIS wasn't operating. "Strikes of that kind would question Russia’s real intentions fighting ISIL or protecting the Assad regime," he said, using another name for ISIS. Courtney Kube and The Associated Press contributed.